« Around The World In 21 Days: Back In Tokyo! 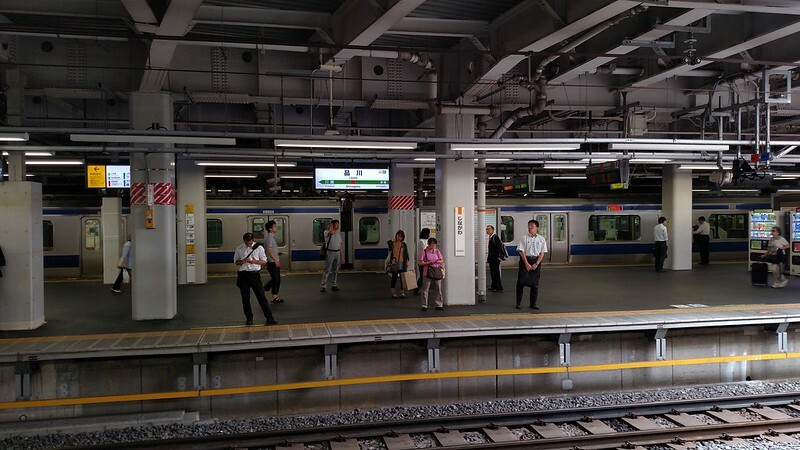 Standing on the platform at Shinagawa Station waiting for the Narita Express train to pull into the station seemed like an eternity. I didn’t want this trip to over and I knew that once I got on the train, it really would be the beginning of the end. As much as I really did need to get back to the real world, the longer the train took, the more I got to delay the inevitable. Sadly that was not indefinite and after about 15 minutes of standing on the platform the train doors opened and I took my seat. Before I knew it, the train pulled into the the station at Tokyo-Narita and it was time to make my way into the departures hall. 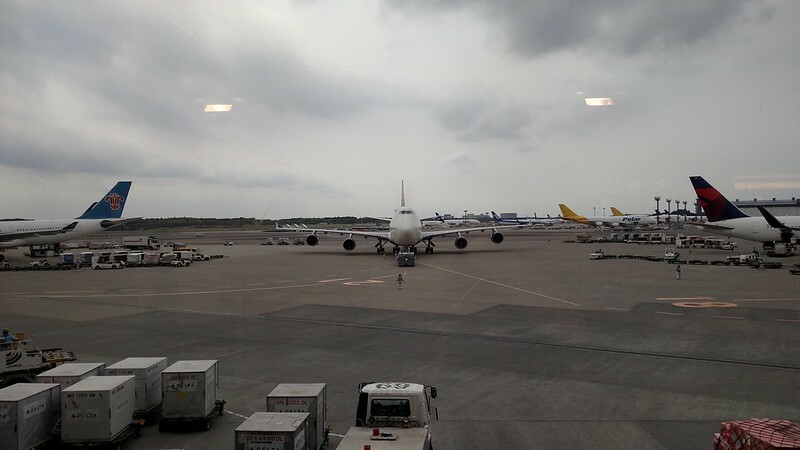 The last time I was leaving from Tokyo, the 2011 Earthquake had just happened and the airport was a complete mess. Long lines, distressed travelers, and clearly frazzled employees trying to get through as many people as possible, especially those who had missed their flights in the days the airport had been closed. This time, however, it was much different for obvious reasons. 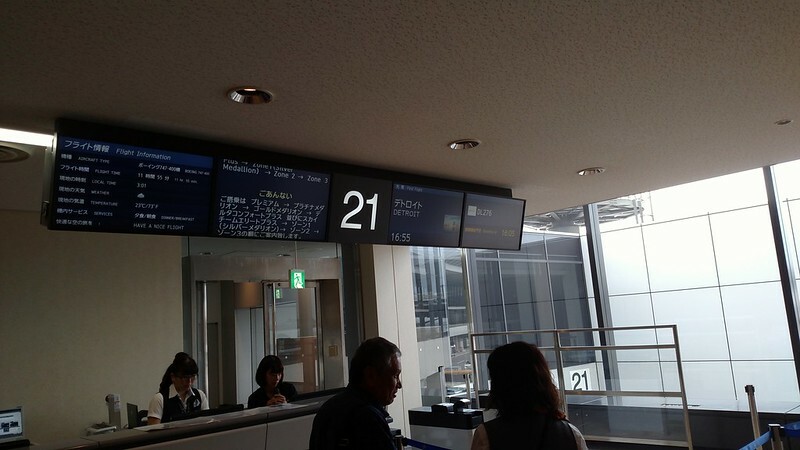 The departures hall was relatively quiet for a large international airport, and I made my way to the Sky Priority check-in line where I quickly had my bag checked and boarding passes printed. 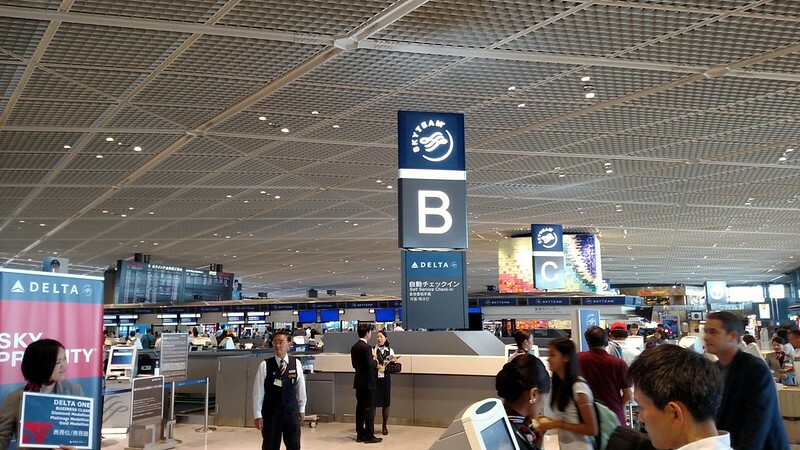 Thankfully, Tokyo-Narita features a security checkpoint for Sky Priority (and other Business Class and elite passengers) and with no wait at exit immigration controls, I was airside in no time. 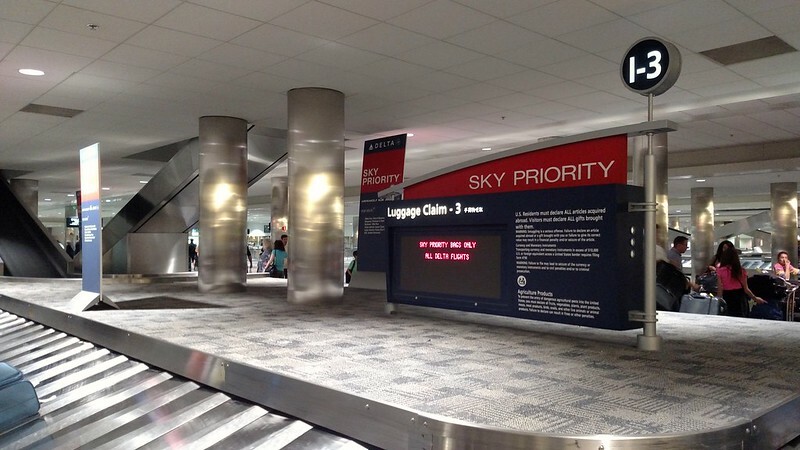 Within Terminal 1, where Delta operates from, there are two Delta Sky Clubs as well as the Korean Air Lines Lounge. 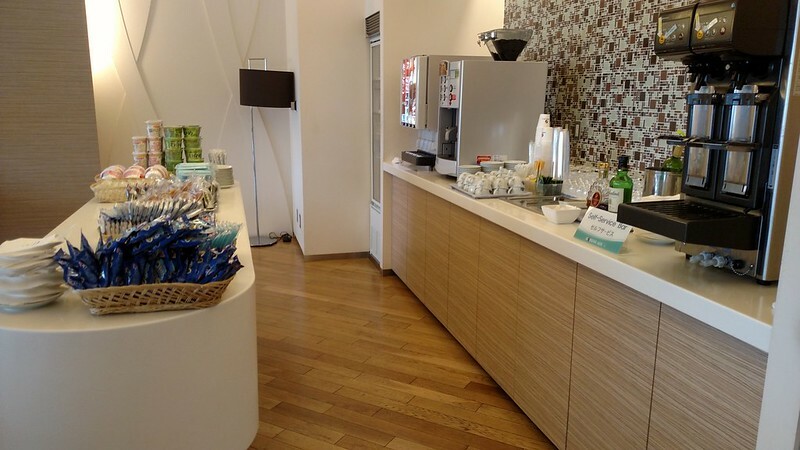 There had previously been an Air France Lounge that I had visited back in 2011, but that lounge had since been closed. Still, this represents a decent selection and plenty of opportunity should you find one to be just too crowded. 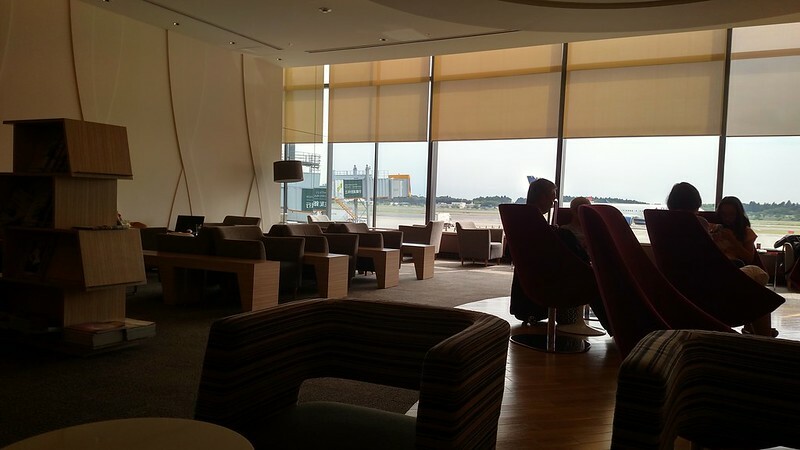 I started out with the Korean Air Lines Lounge as I had never visited this lounge before or any other Korean Air Lines Lounge. I wasn’t sure what to expect, so after doing some shopping at the duty free shops, I stepped through the sliding doors and handed over my boarding pass for admittance. Upon entering the lounge, I was pretty quickly disappointed. It’s a decent sized lounge, but it is essentially one giant square room. Sure it’s bright thanks to the large windows looking out towards the ramp, but they didn’t do anything to try to break up the space within. 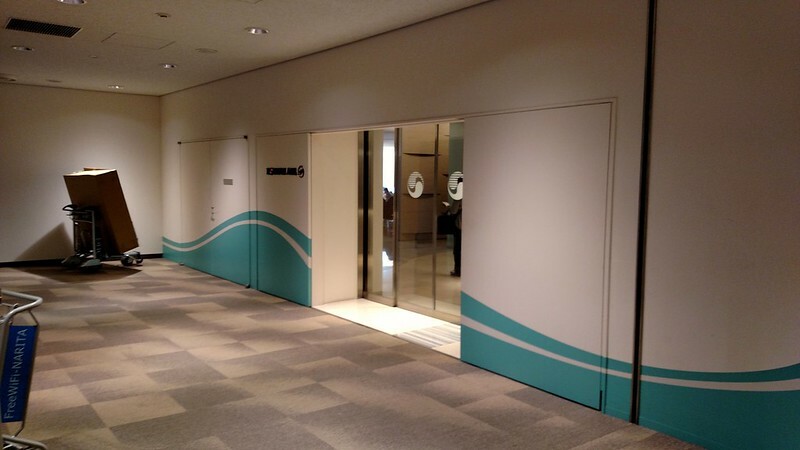 Overall, however they did have fairly modern furnishings and everything looked clean and orderly. On the food front, I would have expected a much better spread. I think that is what we come to expect from those major foreign airlines, however I will say that I think in Tokyo, Delta has the much better food and drink selection at Tokyo-Narita. In the end I wound up just having a beer and some nuts as I wasn’t feeling the instant noodles. 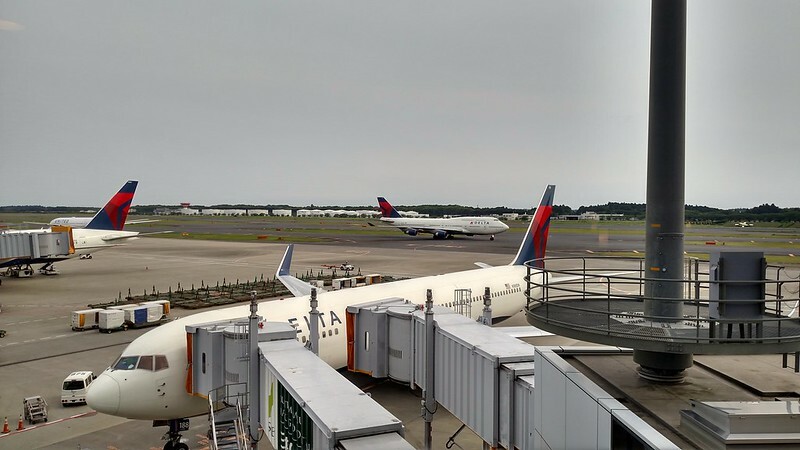 I could have tried to visit both of the Delta Sky Clubs at Tokyo-Narita, but I decided since I’ve been to both multiple times, it would just be best to pick one and wait out for my flight. 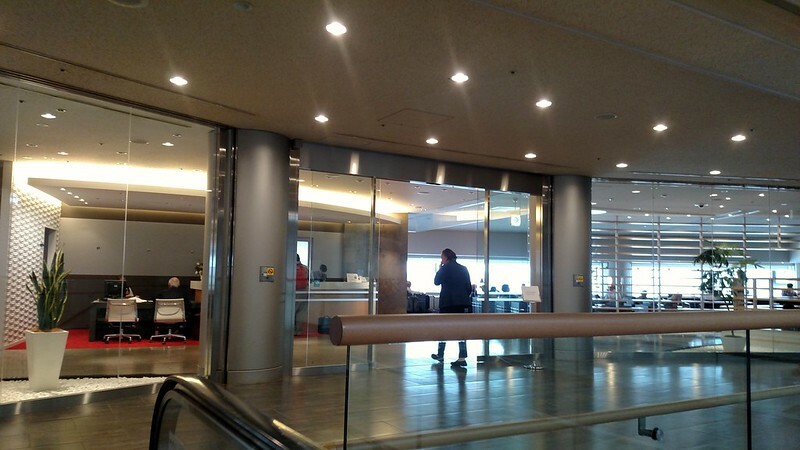 With that said, I headed to the Satellite 1 Sky Club, which in my opinion is the better of the two lounges. Why? 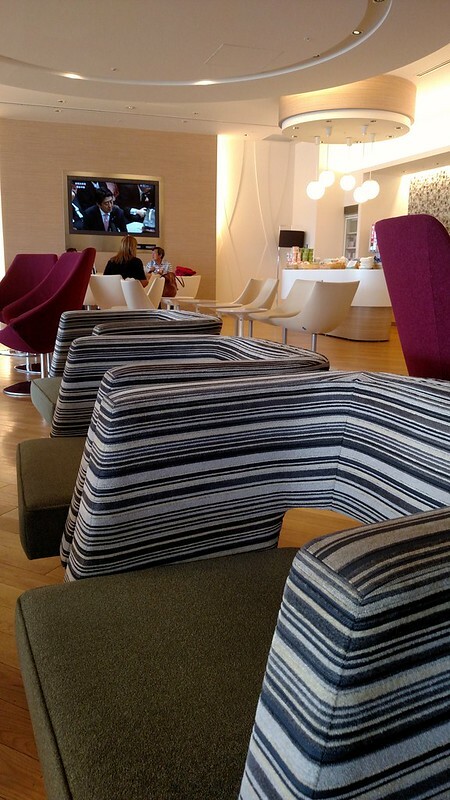 It definitely feels like the more modern and bright lounge compared to the smaller one in Satellite 2. 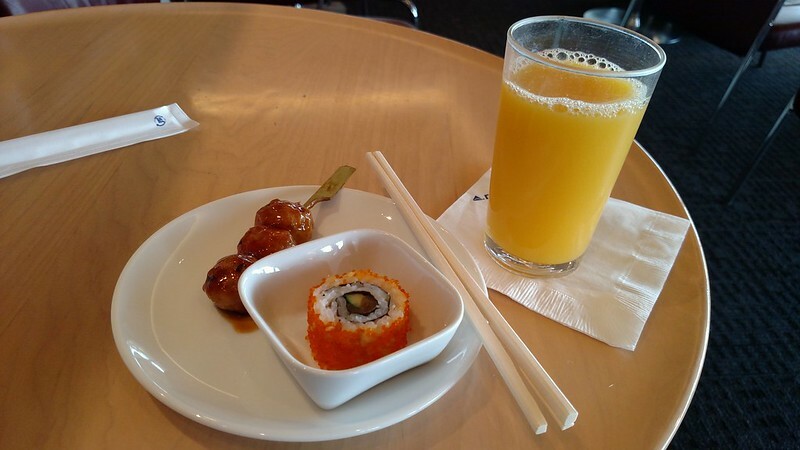 I wasn’t sure if I was starting to come down with something or not, so I decided to pass on any further alcohol in the lounge and decided to partake in some orange juice to pair with my sushi and meat on a stick. I spent my time here after enjoying my snack mostly trying to sit back and relax. I’d be crammed into my economy class seat for the long flight to Detroit, and so I wanted the bit of breathing room that I would get in the lounge before the flight. I used the time to watch the other flights come and go out of the adjacent gates before making my towards my waiting aircraft. Of course on the way out, I did ask at the counter how full the flight was in an attempt to find my way into Business Class, but I was not so lucky. Much like how Southwest Airlines likes to line people up by boarding group, here in Tokyo, the agents in the gate area will go through and hold up signs to get people lined up by boarding zone. I mean, if it weren’t for that, let’s face it we would all be crowding the gate area anyways, right? I’m sure we all say that we don’t…but then I wouldn’t be trying to push my way through large crowds when they call PREM or SKY boarding groups. Once on the aircraft, I settled into my seat on the right side of the aircraft in a Comfort+ aisle seat. Although it’s still really Economy Class, I do find that those few extra inches of legroom definitely help make the flight more comfortable. Especially once I change into more comfortable clothes, I can usually get stretched out enough to at least get some intermittent sleep. 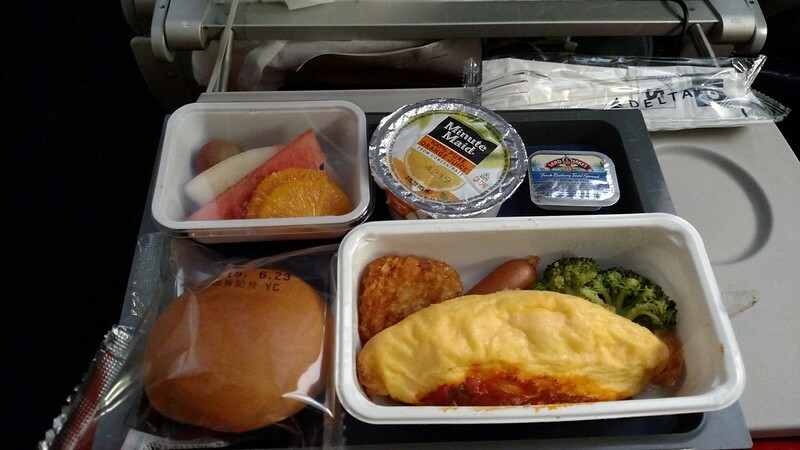 The meal services on this flight were exactly what you would expect in Delta’s Economy Class; unlike the first international leg of this trip flying Atlanta to Johannesburg where the second meal looked more like a meal that you would see in Delta’s domestic First Class. 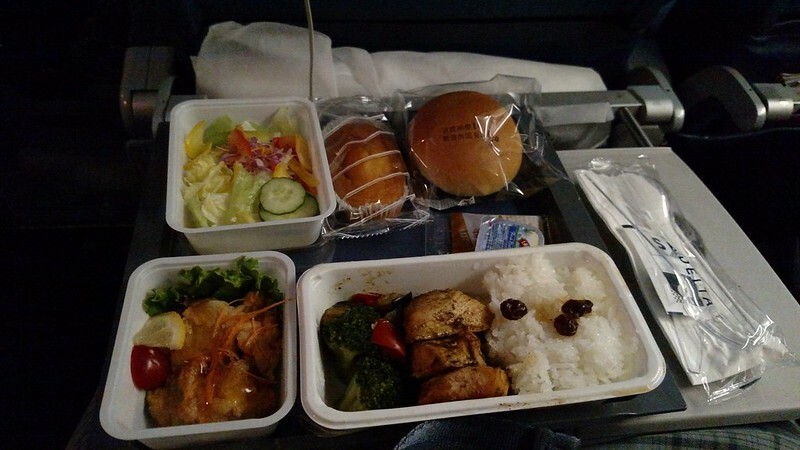 For the dinner service, which was served about two hours after takeoff, I opted for the chicken and rice main course that came with a fried chicken starter, salad, roll, and a slice of cake. It was generally decent, and definitely much better than my meals on Vietnam Airlines from Bangkok to Tokyo! For the breakfast service, I opted for Omelette, served with broccoli and a tiny hashbrown wedge, fruit and a roll. It was a dinner roll, which was a little odd, but at least it wasn’t pretending to be a breakfast pastry like on Vietnam Airlines. Overall, it was decent enough and comparable to other omelettes that I’ve had when flying Delta. 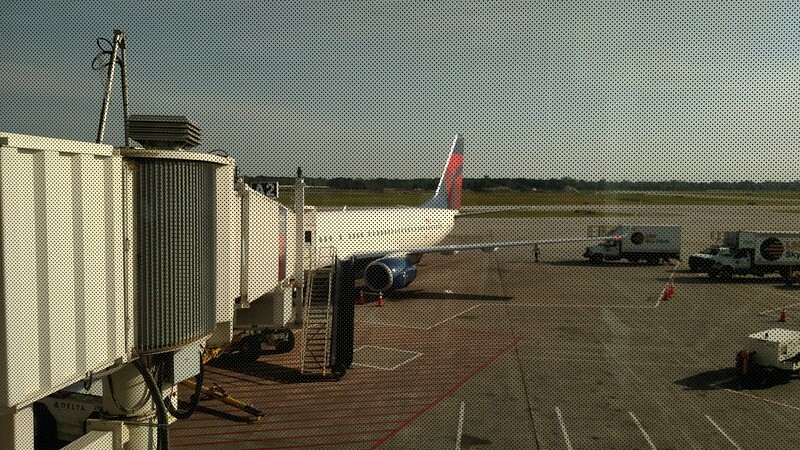 A slightly earlier-than-scheduled arrival marked my first time landing at Detroit from an international destination. I was pleasantly surprised that in Detroit, Delta has a separate baggage claim belt that is solely for all Sky Priority bags, regardless of flight. While in theory all Sky Priority bags should come out first, this at least could make the the whole having to push through crowds after a long flight on a large plane. This was certainly the case on this trip, where I only waited for a brief five minutes after clearing immigration (which was also pretty painless!). Working my way towards the Customs check, I did manage to get singled out for a secondary inspection, which seems to happen nearly every other trip. 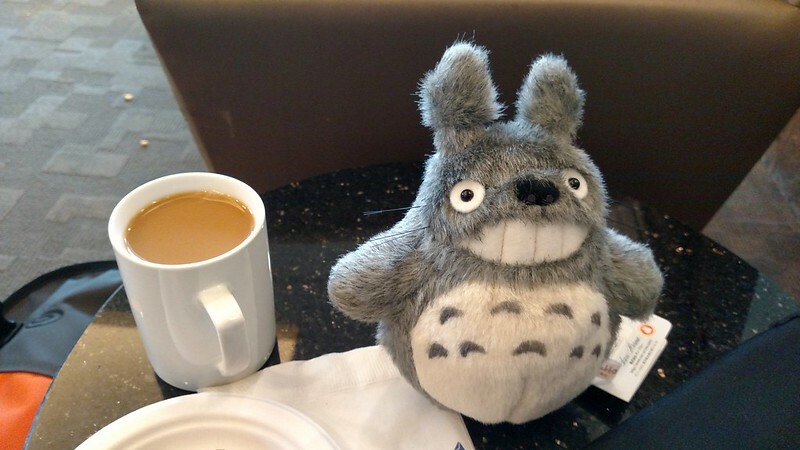 The CBP agents at customs, were friendly and professional as always, and the one who stopped me even pointed out the small stuffed Totoro that I bought at the duty free in Tokyo-Nartia to spend some of my remaining yen. I’m sure the decision to send me for the secondary inspection was based on the relatively exotic list of countries I had listed on my declaration form, and I wasn’t really even surprised that it happened. The CBP agent performing the actual inspection, quickly opened up my duffel, confirmed my declarations, and then sent my bags through X-Ray. With nothing suspicious in my bags, I was on my way to the security re-check in a few short minutes. As always, being honest and providing direct answers is the best policy when dealing with Immigration or Customs in any country! Of course, I would go on to win what I call the “DHS Lotto”, in that in clearing security after customs to go into the terminal resulted in me getting a secondary screening too! Again, I figured all the electronics in my carry-on probably was the trigger and they quickly had me back on my way. Just kinda funny when I look back at it. I made my way to the only spot in the Detroit airport that I have spent any considerable amount of time: The Sky Club located at the center of Concourse A. Immediately after getting to the top of the escalator, I made my request for a shower and settled into a chair thinking that it was going to be a bit of a wait. 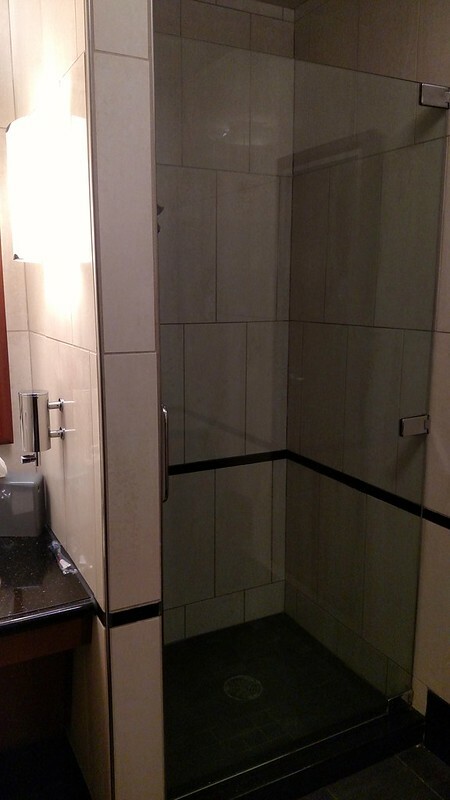 Thankfully, I think hardly enough people know that showers exist within the lounge, so just a after getting settled into a corner of the lounge, I was called right back up to the desk to be let into one of the few shower rooms. It’s definitely time for the showers in Detroit to be updated, as they were looking a bit worn out; additionally I had to go back to ask for towels, as there wasn’t any left in my shower room after they cleaned it. After getting that super-relaxing shower, I finally took the opportunity to sit down, and enjoyed a few cups of coffee and several of those oddly delicious cookies that were originally found only in those former Northwest Airlines World Club locations. I think I did get a little stir crazy after only a bit in the lounge, so I decided to head to the gate a little on the early side. Getting to the gate early, it turned out I got to see something that would make this flight unique. As I waited, I eventually saw a large quantity of armed police and Federal Agents approach the gate; in the middle of the group of law enforcement, someone who was clearly in custody. The took the person in question, on the plane, and I never saw them again. I assume they were seated at the rear of the aircraft, and I was pretty near the front. The two hour flight down to Atlanta was pretty average otherwise. Snack and beverage service was on point and I spent most of the flight partaking in the in-flight entertainment options while trying to continue staying awake; upon arriving in Atlanta I would need to make my way to my final hotel of the night. The best part? My bag was already on the belt by the time I made it to baggage claim, so I just had schlep my bag to the hotel shuttle area. 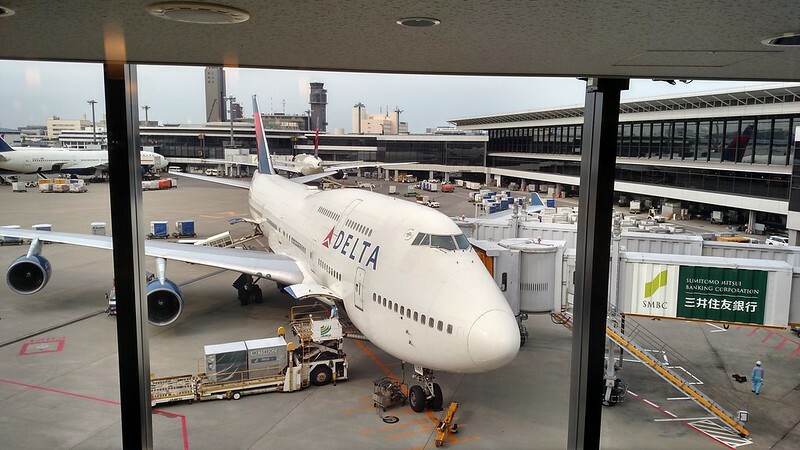 This entry was posted in Delta, Japan, RTW, SkyTeam, Travel, Trip Report. Bookmark the permalink. Follow any comments here with the RSS feed for this post. Post a comment or leave a trackback: Trackback URL.